Clearwater, Florida is an ideal destination for families, couples and group travelers alike. 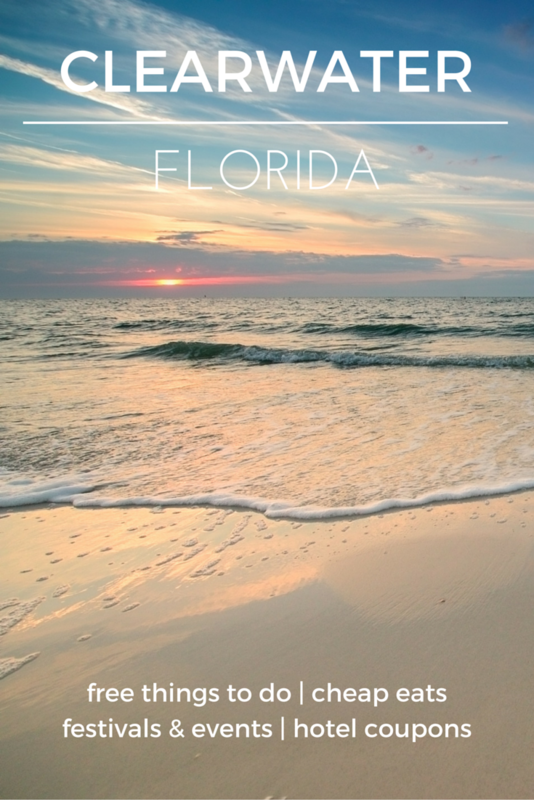 Just 30 minutes from Tampa and two hours from Orlando, It’s easy to travel to the beautiful Gulf Coast in Clearwater. There are so many great attractions in Clearwater and activities to enjoy year-round. In addition to the unbeatable sugar-sand beaches, water sports and natural parks, there’s more to explore. One of the top attractions in the area is the Clearwater Marine Aquarium, made famous by the movie Dolphin Tale. This center provides education to the public and rehabilitation to sea animals. For a theme park experience, travel just 45 minutes to Busch Gardens in Tampa. Interested in art and culture? Visit the Museum of Fine Arts, the Dali Museum, or the Morean Arts Center in nearby St. Petersburg, which features the renowned Chihuly Collection of blown glass. Plus, shop near the beach along Causeway Boulevard or Mandalya Avenue for specialty items, souvenirs, and more. Save on your next trip to Clearwater by using our online hotel coupons, which will help you get the best available same-day rate at quality hotels. This free park is a must-see for visitors to Clearwater and St. Petersburg, Florida! Featuring the boardwalks, wildlife and natural vegetation of a nature preserve, plus a 35-foot-tall observation tower, visitors can experience the Florida outdoors first hand. But, you’ll also find impressive amenities including a dog park, playground, restrooms, canoe launch and fishing opportunities. Every night of the week, visitors of all ages can enjoy a special festival with local artists, live performances, musical entertainment and more. There’s no better way to watch the sun go down over the Gulf. Discover more than 50 uniquely decorated fiberglass dolphins in the Clearwater area by following the Clearwater Dolphin Trail. Each dolphin was designed by a local artist to celebrate the city of Clearwater, Florida. Suncoast Seabird Sanctuary is a great attraction for people who enjoy natural wildlife. More than 8,000 injured birds are nursed to health here and released back into their natural habitats. Merry Pier offers a great location for fishing with no fees (just be sure you have a permit). Here you’ll also find a bait shop, boat charters and more. This more than 3,000-acre preserve is the perfect place to explore the Natural History Center, take a guided nature tour, go fishing or canoeing, and much more. You won’t believe that Weedon Island Preserve offers free admission! The Booker Creek Preserve features hiking trails, horseback riding trails, a boardwalk, and an environmental center. This natural preserve spans about 8,700 acres. This Clearwater food and wine festival is perfect for those who appreciate the finer things. Don’t miss out on this popular event overlooking the Gulf of Mexico. If you like seafood and blues music, there’s no better festival for you! Mark your calendars for the Clearwater Sea-Blues Festival at Coachman Park. Head over to Brighthouse Field in Clearwater for exciting Phillies Spring Training Games. Whether you’re a lifelong fan or simply looking to enjoy America’s favorite pastime, you’ll love Spring Training. Fuel your need for speed by attending the Grand Prix of St. Petersburg, held annually on a temporary street course in Downtown St. Pete. Spectators will feel the thrill of the race overlooking Tampa Bay. You may have built a sand castle in your day, but you’ve never seen creations like these! The sand sculptures are the Sugar Sand Festival will blow you away. This specialty event offers attendees the rare opportunity to see the world’s finest cars, boats and planes up close. See displays from Maserati, Aston Martin, Bentley, Bugatti and more luxury brands. Experience this annual music series and enjoy the city of Clearwater, Florida! The Fun ‘n Sun Celebration is held in Coachman Park each year. Celebrate Independence Day at Clearwater’s annual Fourth of July celebration. You’ll find food, music, fireworks and more in Coachman Park at this free event. Speed boat races in the crystal-clear Gulf of Mexico? That’s what you’ll enjoy if you attend the Super Boat International when it comes to Clearwater, FL. Experience smooth jazz and Gulf Coast breezes at Clearwater Jazz Holiday. This music event features some of the top jazz artists today. Soak up the holiday spirit at the annual Lighted Holiday Boat Parade. More than 50 boats will be decked with lights and holiday décor in this celebration by Island Estates Yacht Club.